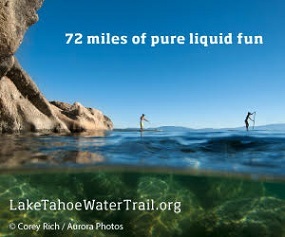 Kristen Schwartz gets her daily dose of creative energy from Lake Tahoe and brings it to her business, Faery Medicine. 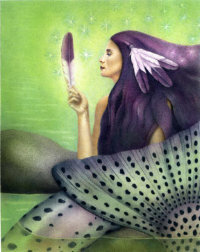 In her art you will find local icons like Cave Rock Woman and Lake Mother along with other culturally inspired images. Cultural mythology and healing customs from around the world play a big part in Kristen’s stirring work. Her hope is that her illustrations will spark an interest in the vast indigenous wisdom that exists before it disappears completely. Kristen started as a local botanical illustrator drawing native medicinal plants for books such as, Kimball Chatfield’s Medicine From the Mountains – Medicinal Plants of the Sierra Nevada. Once she began her fantastical illustrations for Faery Medicine, she also started producing prints and cards of the images. They are all hand produced and created on demand right here in Tahoe, ensuring quality and reducing waste. Recently, Kristen also developed a method of printing her images on raw silk – an amazing alternative to paper. See more of her work at www.faerymed.com.